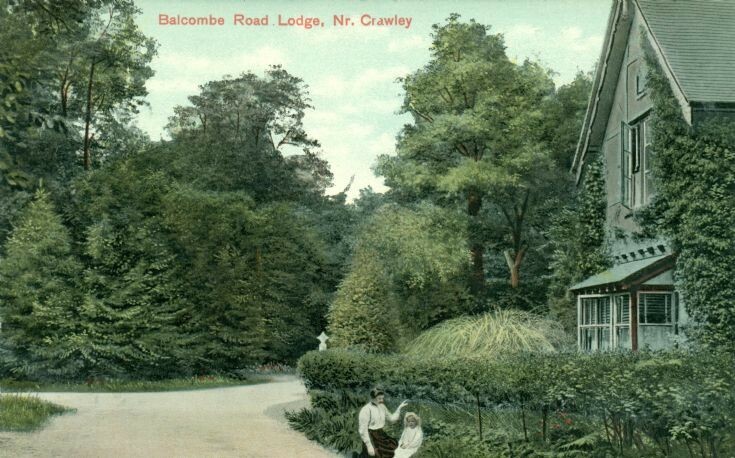 This tinted photograph of East Lodge in the Balcombe Lane shows two figures. Another copy of this postcard has already been uploaded as picture #20. On the reverse the figures have been identified as, on the left, Mabel Tester (1890-1984) who went on to marry Henry “Harry” Field (1887-1969) in 1915. They ran the butchers shop opposite the Red Lion for many years in the middle part of the large century. The smaller girl is Mabel’s youngest sister, Winifred Margaret Tester (1900-1991), who married Ronald Gander in 1926. The Large Version shows a close up of the figures. Select Open Document to view a copy of the reverse of the postcard. My father, William Tester, was born there.